List of contributors. Acknowledgements. Introduction: Understanding brain and cognitive disorders: the computational perspective (E. Ruppin, J.A. Reggia, D.L. Glanzman). Neuromodulation and the hippocampus: memory function and dysfunction in a network simulation (M.E. Hasselmo). Cholinergic neuromodulation and Alzheimer's disease: from single cells to network simulations (E.D. Menschik, L.H. Finkel). Episodic memory in semantic dementia: a computational approach based on the TraceLink model (K.S. Graham, J.M.J. Murre, J.R. Hodges). Multimodular networks and semantic memory impairments (D. Horn, N. Levy, E. Ruppin).II. Neuropsychology. Understanding failures of learning: Hebbian learning, competition for representational space, and some preliminary experimental data (J.L. McClelland, A. Thomas, B.D. McCandliss, J.A. Fiez). Frames of reference in hemineglect: a computational approach (A. Pouget, S. Deneve, T.J. Sejnowski). A new model of letter string encoding: simulating right neglect dyslexia (C. Whitney, R.S. Berndt). Prosopagnosia in modular neural network models (M.N. Dailey, G.W. Cottrell). Functional brain imaging and modeling of brain disorders (M.A. Tagamets, B. Horwitz).III. Neurology. Unmasking unmasked: neural dynamics following stroke (W.W. Lytton, S.T. Williams, S.J. Sober). Effects of callosal lesions in a computational model of single-word reading (J. Chhabra, M. Glezer, Y. Shkuro, S.D. Gittens, J.A. Reggia). The gating functions of the basal ganglia in movement control (J.L. Contreras-Vidal). Motor fluctuations in Parkinson's disease: a postsynaptic mechanism derived from a striatal model (R. Kötter). Thalamic and thalamocortical mechanisms underlying 3 Hz spike-and-wave discharges (A. Destexhe, D.A. McCormick, T.J. Sejnowski).IV. Psychiatry. Using a speech perception neural network simulation to explore normal neurodevelopment and hallucinated "voices" in schizophrenia (R.E. Hoffman, T.H. McGlashan). Dopamine, cognitive control, and schizophrenia: the gating model (T. Braver, J. Cohen). Modeling prefrontal cortex delay cells: the role of dopamine in schizophrenia (A. Reid, D. Willshaw). Neural models of normal and abnormal behavior: what do schizophrenia, parkinsonism, attention deficit disorder, and depression have in common? (S. Grossberg). A neural network model of attention biases in depression (G.J. Siegle). Subject Index. 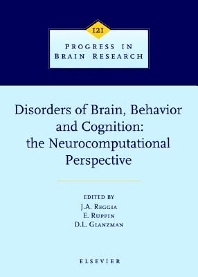 This book contains selected contributions of papers, many presented at the Second International Workshop on Neural Modeling of Brain Disorders, as well as a few additional papers on related topics, including a wide range of presentations describing computational models of neurological, neuropsychological and psychiatric disorders. It is a unique, comprehensive review of the state-of-the-art of modeling cognitive and brain disorders, appealing to a multidisciplinary audience of clinicians, psychologists, neuroscientists, cognitive scientists, computer scientists, and other neural network researchers. The rest of the book is organized along four main themes, involving memory, neuropsychological, neurological and psychiatric disorders. In general, the cognitive disorders and these psychiatric diseases traditionally regarded as "functional" were modeled along functional lines, while those disorders traditionally viewed as "organic" neurological diseases generally drew more from knowledge of the underlying neurobiology and pathophysiology.